Two separate 'tap forward' zones? I'm using KoReader on Pocketbook TL3. Is it possible to create two separate tap zones for "tap 1 page forward" on the left and right side of screen and invoke menu by tapping in the center? Like it is in Pocketbook? Because some of my books don't work with KoReader (books from paid service, probably something with encryption), so I have to read them on default PB reader. When I switch between both readers I often get their tap zones mixed up and for example tap in the center for menu while in KoReader. Last edited by Pavati; 03-25-2019 at 03:38 PM. Well, you can have one big zone for forward taking middle part and for backward, you can set lower part, but it would go across whole screen (not in 3 and 2 separate zones). But, parts you don't touch, want be important to you. To do that, you need to edit defaults.lua (rename it afterward to defaults.persistent.lua, so it doesn't get overwritten) in kobo root directory. Edit what is red to suite your needs. As you can see (this is how I set it for myself) you also use decimal numbers, not only fractions. And for menu, it is either swipe down from top of screen, or can be some other gesture (now we have gesture manager). Anyway, I think you can't get exactly as you want, but you can get close enough. Last edited by Alan_S; 03-25-2019 at 04:00 PM. Then modify the tap zones in defaults.persistent.lua. I think this gives the zones what you want. 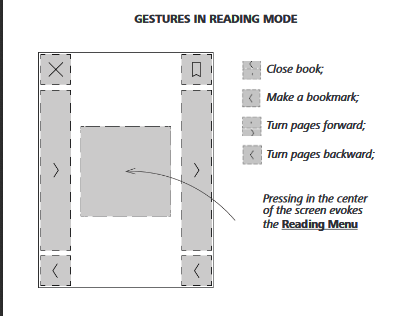 I use something similar on my Kindle except I don't have a tap zone for previous page at all. I use swipe for that. Majority of the touch area is set to forward on mine. You can if you overlap zones. I have width set to 1 for DTAP_ZONE_FORWARD on mine with menu/config zones superimposed in the middle. Works okay on my Kindle (left and right taps go forward, middle tap brings up the menu). Perhaps it is time to consider user developed "Templates" to set KOReader's UI to match other existing interfaces. I can see where someone might get familiar with a device's stock UI, and then only be comfortable if things work, on that device, in the manner they are used to. Then there those of us who may use KOReader on more than one device, and would like KOReader to function (to the extent possible) the same, no matter which device you are using it on. As configurable as KOReader is, it should be possible to match the UI for any shared functions, with the use of such templates. Last edited by Ken Maltby; 03-27-2019 at 03:03 PM.